Last Saturday, seasonal bike rental service returned to Lloyd Hall. A new concession between Philadelphia Parks and Recreation (PPR) and Wheel Fun promises a more robust inventory of rental bikes as well as a new Center City location at the Fairmount Park Welcome Center in JFK Plaza (Love Park), which will open in late April or May in time for Bike to Work Day. Wheel Fun is a national franchise operation that specializes in hourly rentals. They will be open on weekends until Memorial Day from 9:00 AM to dusk, then 7 days a week from 9:00 AM to dusk through the fall. In addition to bikes and tandems, Wheel Fun also offers for rent surreys (also known as quadracycles) and double recumbents. You may have seen these in the early morning rumbling down the boardwalk in Seaside, Ocean City, or Wildwood. 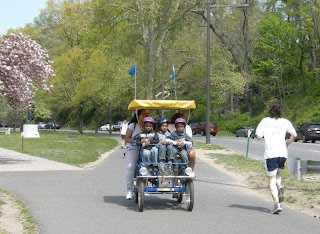 These slow moving pedalcycles appeal to families or friends who wish to socialize while they pedal at slow pace. PPR has restricted the operation of the surreys to an out-and-back route from the Italian Fountain Circle to the Girard Avenue Bridge. They are closely monitoring the situation to see if the surreys can co-exist with the many different park trail users. While surreys find acceptance on wide promenades, they do take up a large portion of the narrow multi-use path on the busiest section of the Kelly Drive path. We are supportive of having more people enjoy the trail through bike rentals, but are concerned about the size of the surreys on a heavily used trail. We understand that PPR has agreed to allow surrey rentals as long as they do not prove to be a safety hazard on the trail. With or without surreys, conflicts on the Kelly Drive path are a compelling enough argument for relieving trail congestion by improving the bridge link to the Martin Luther King Drive trail. That would eliminate the pinch point which prevents or deters many bicyclists from riding along the west side of the Schuylkill River. PPR is also moving ahead with striping the loop, from Schuylkill River Park to the Falls Bridge, including MLK Drive. For the surreys, a new turnaround pad will be constructed a little north of the Girard Avenue Bridge. It is hoped that these improvements will improve safety by reminding all users, including surreys, to keep to the right. Wow! Surreys on this, the most busy stretch of the SRT, in front of boat house row no less!!! I highly doubt that this is going to work. I can't believe that it is even being considered. I've had WAY too many close calls on this stretch and I take it slow and stay hyper alert. While we're at it, why don't we put Kelly Drive on a major road diet so that more experienced cyclists can ride on it in a well designed bike lane and let the pedestrians, kids and other beginner cyclists ride on the sidepath. Then we can talk about putting surreys on the SRT.